The FHA has played a major role in helping home buyers purchase home since the collapse of the mortgage industry. Over the years the FHA has increased and decreased the mortgage insurance premiums it has charged to borrowers. However, the recent decrease in mortgage insurance premiums by the FHA and FHA mortgage rates makes the FHA Streamline Refinance an attractive home loan. If you have been keeping an eye on mortgage rates you will have noticed that they continue to reach new historic lows all the time. Since 2010 FHA mortgage rates have decreased from 5 percent to today's current level of roughly 3.75 percent. This means that home owners who have not refinance since buying their home in 2010 could lower the interest rate well over 1 percent. On a $200,000 home loan this means that a home owner could save $150 or more in principle and interest each and every month. Additionally, a home owner could choose to lower the term, receive a lower interest rate, keep their payment roughly the same as it is now, and save thousands of dollars in interest by taking advantage of an FHA Streamline Refinance today. If lowering your interest rate doesn't excite you than maybe the fact that the FHA has lowered its monthly mortgage insurance premium to the lowest level it has been since October of 2010. At its highest point the monthly mortgage insurance premium reached 1.35 percent. The recent changes made have lowered this mortgage insurance to just 0.85 percent allowing homeowners to take advantage of additional savings on top of a lower interest rate. If you do have an FHA home loan it is strongly encouraged that you do look into the options that are available to you when it comes to refinancing. After all, the Federal Reserve has been talking about increasing the Federal Funds rates and once that happens mortgage rates will likely follow shortly afterwords. 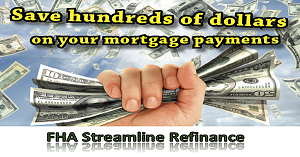 Learn more about the FHA Streamline Refinance.